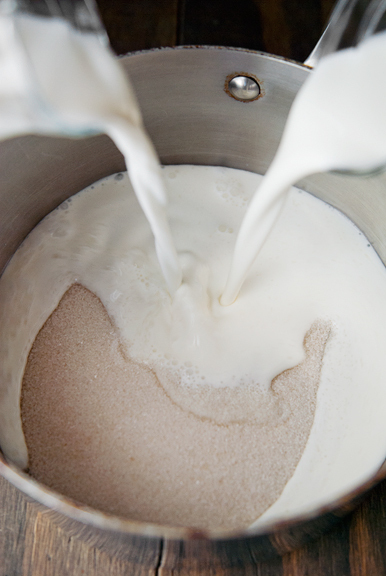 The key is to make the ice cream custard, but to wait to churn it until you are ready to fill the bombe shells. It can be made a day or two in advance and kept chilled in the refrigerator. 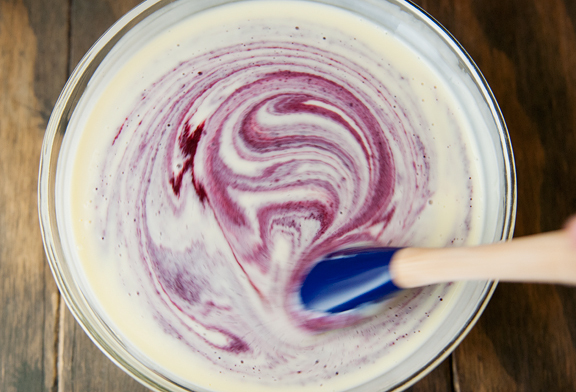 One of the reasons I love to make berry or cherry ice creams is that the deep jewel colors turn the ice cream into the prettiest shades of summer. While the custard chilled overnight in the refrigerator, I found myself wondering how on earth I was going to get the bombe halves to adhere to each other. A little research helped me figure out how to make a hollow chocolate sphere (just rub the chocolate hemisphere edges briefly on a hot pan and let the melted chocolate fuse the two halves into a sphere), but my hemispheres were not going to be hollow. I cannot tell you how many brain-hours my mind was occupied with this issue. Once the ice cream is churned, it is in a soft-serve state. This means the ice cream can be shaped easily, but it also means that you must work quickly before it reverts back to a puddle of delicious custard. I overfilled my chocolate shells with ice cream, then used a metal icing spatula to make the top surface as even as possible. Freezing the ice cream in the molds means two things: 1) less chance of breaking the chocolate shells when you unmold them (as opposed to unmolding a thin chocolate shell on its own) and 2) the ice cream remains level as it freezes because the molds lie flat (the chocolate hemispheres can roll about). I took the lazy way out after I realized that ice cream sticks to itself when it gets a little melty and then refreezes. This presents its own inherent structural problems when the ice cream begins to melt, but I wound up with a 66% success rate. In hindsight, I think a cherry mousse might have worked better as it merely needs to be cold and not frozen like the ice cream. 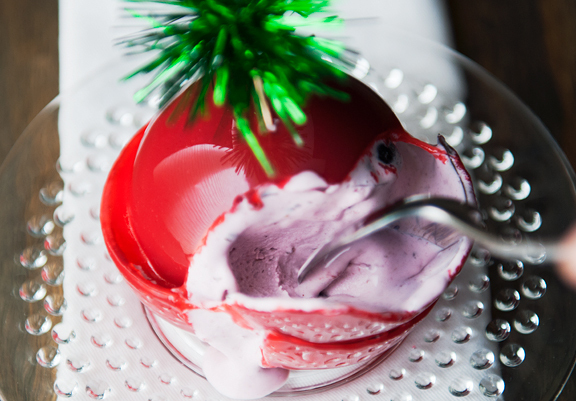 Alternatively, instead of insisting on a sphere, leaving the ice cream as a hemisphere and setting it on a round cake base would also have been easier to manage. 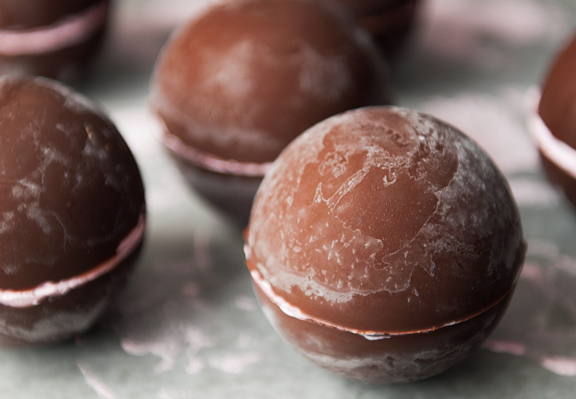 Once you have your completed spheres, return them to the freezer to allow the halves to fuse/freeze together. Mine had a tendency to roll, but luckily none of them broke (yet). I should have returned them to the silicone molds for stability, but those were already in the sink. While the spheres chilled, I made my glaze. I was nervous, because I hadn’t made the glaze before and had no idea what to expect. It’s actually quite straightforward and well-behaved as glazes go. What I didn’t realize was that the glaze would be this slightly translucent yellowish color. It isn’t white because the ingredients aren’t white (also, I used white sugar in this glaze instead of my usual organic cane sugar which has a brown color). Apparently there is a white food coloring gel to make your glaze white. Since I was aiming for a “cherry” I figured the translucent bright red over the dark chocolate would be more or less cherry-colored, but if I wanted pure red, I think I’d have to get my hands on some of that white food coloring. The things you learn! 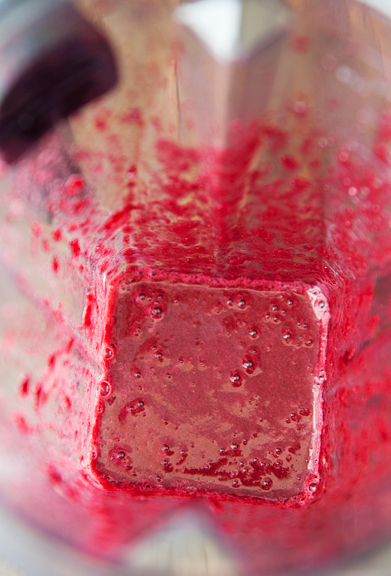 The glaze can be applied multiple times because I could see the ice cream “seam” under the first two coats. I went with three coats. I had two of the six spheres partially collapse because I had cracked the shells when trying to tap a small hole in the top of each sphere for my green sparkly toppers. 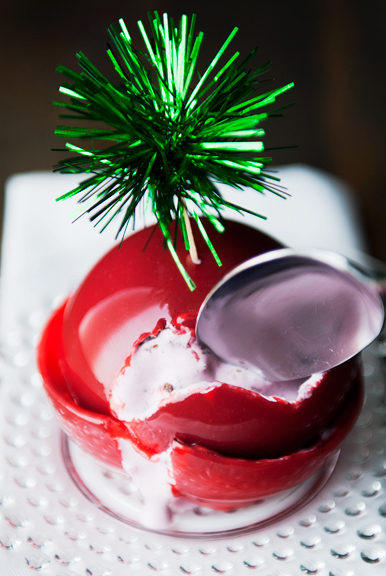 The problem with having an ice cream bombe is that the ice cream becomes soft after pouring 95°F glaze over it several times. 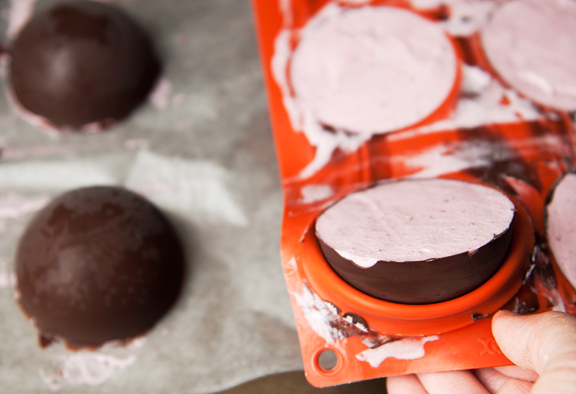 So work quickly and get it into the freezer – but don’t move too quickly or your bombe will roll around and make a mess of itself. How did it taste? AMAZING. I had low expectations of the glaze, but it’s really not offensive – and this is coming from someone who does not like white chocolate. The ice cream is divine and if you use good quality dark chocolate (or milk chocolate or white chocolate), there shouldn’t be a problem aside from actually making this dessert. Again, I suspect if I had used mousse or any filling that didn’t need to be frozen, it might have gone down a little better. Still, I think I can call it a success. I may not make it again in this iteration, but I’ll definitely be playing with the components in the future. 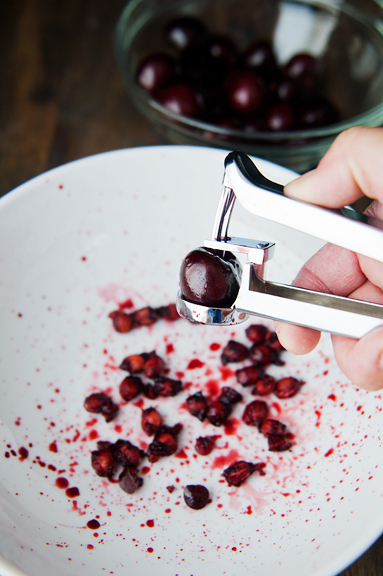 Full disclosure: I received a free shipment of cherries from Stemilt Growers in Wenatchee, Washington with no obligation on my part. All opinions are my own. 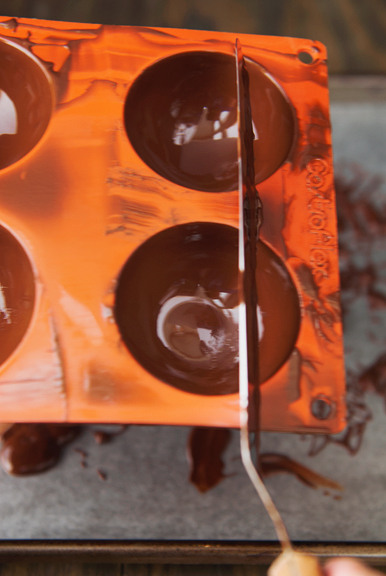 Make the chocolate shells: You can temper the chocolate or simply melt it. 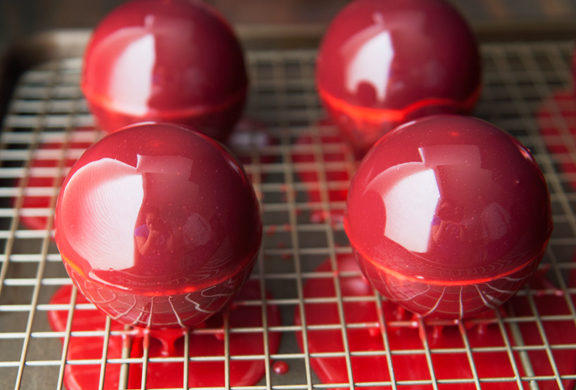 Tempering will give a better texture and snap, and if you don’t plan to use the mirror glaze, tempered chocolate will yield a prettier finish for the bombe. Have a wax paper-lined baking sheet and your bombe molds ready (at least 12 hemispheres) and work one tray of molds at a time (the first 6). Fill each hemisphere at least half full of melted chocolate. 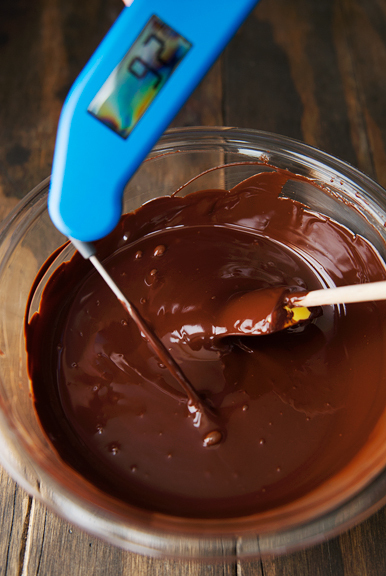 Use the back of a spoon to smear the melted chocolate up and just over the edges of the hemispheres. Work quickly before the chocolate sets. 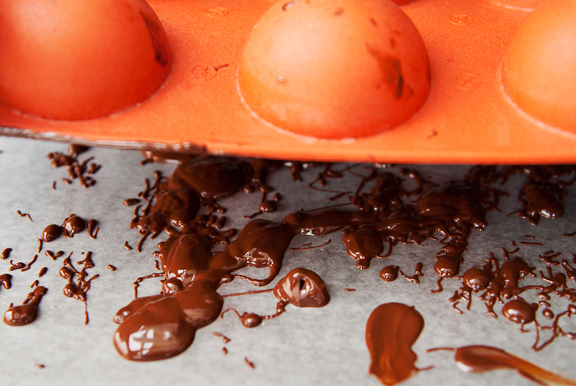 Turn the tray upside down over the wax paper-lined baking sheet and let the excess chocolate drip out (or if you’re fast, you can let the excess drip back into your vessel of tempered or melted chocolate. You can give it a little shake to help the chocolate along. 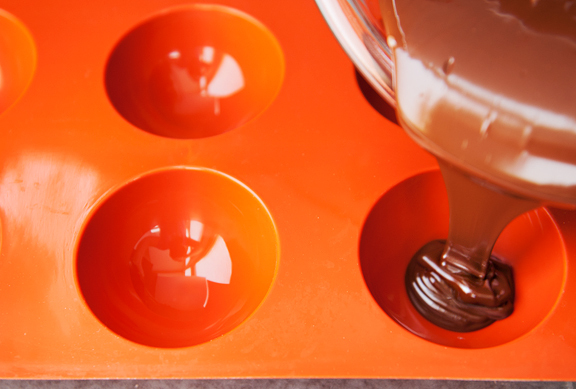 When it stops dripping, turn the tray over and place it in the refrigerator to set. 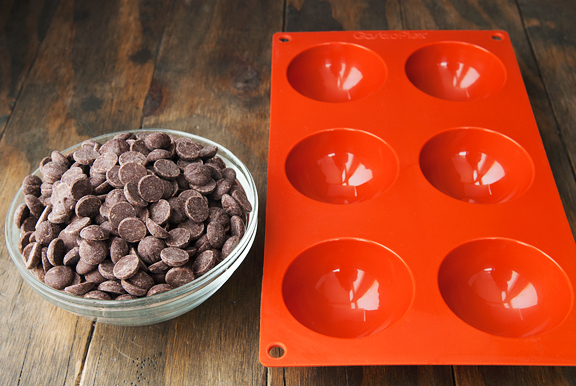 Repeat for the second tray. 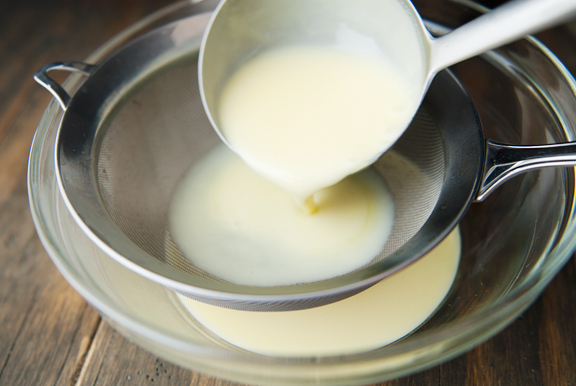 Build the bombes: When the custard is completely chilled, churn a quart in your ice cream machine according to the manufacturer’s directions. 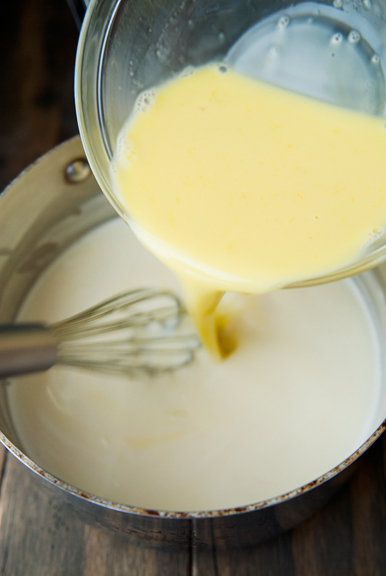 If you have extra custard, save it and churn it after the first quart is done. 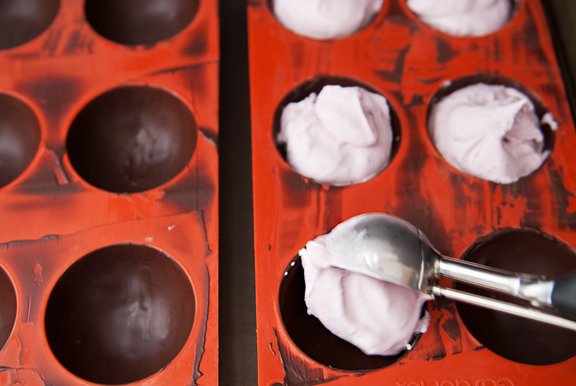 When the ice cream is churned, but at soft serve stage, scoop it into the chocolate shells in the hemisphere molds. 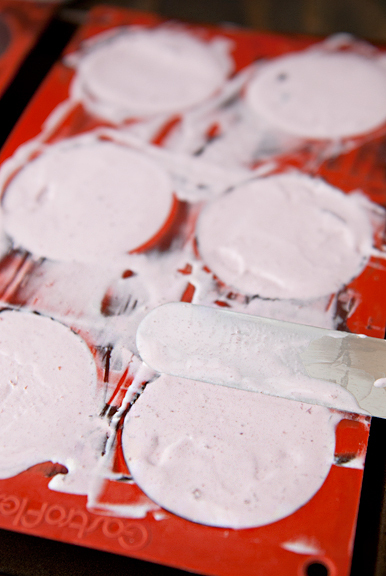 Use a metal icing spatula to level the tops of the ice cream. Set the bombes in the freezer. Freeze any extra ice cream separately. 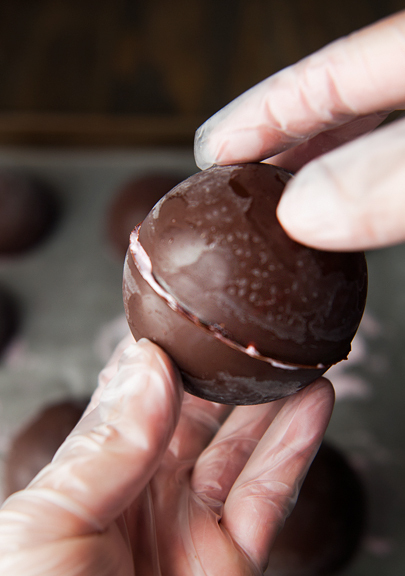 When the ice cream in the chocolate shells has frozen through, carefully unmold the bombes. Take two hemispheres and allow the ice cream faces to melt just a little (if they are really frozen, you can set the faces on a room temperature plate for a few seconds) and gently press the two halves together. Repeat for the rest of the bombes. Freeze with the fusion plane horizontal (at the equator). 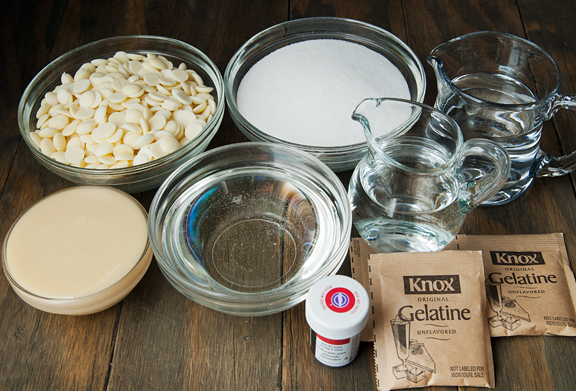 Make the glaze: Bloom the gelatin in a small bowl with 4 ounces of cold water and let sit for 15 minutes. 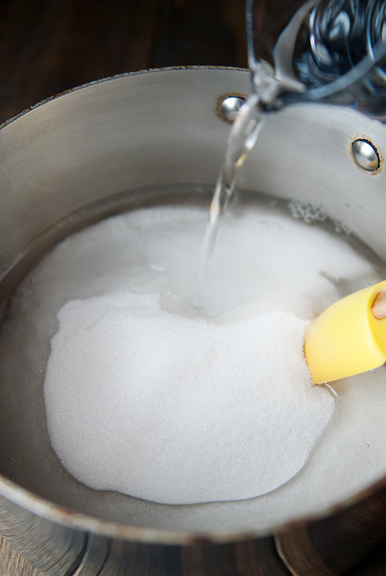 In a medium saucepan, bring the corn syrup, sugar, and 5 ounces of water to a boil, stirring to dissolve the sugar. Continue to boil until the temperature reaches 217°F (200°F for 8500 ft. above sea level – reduce final temperature of 217°F by a degree for every 500 ft. above sea level). 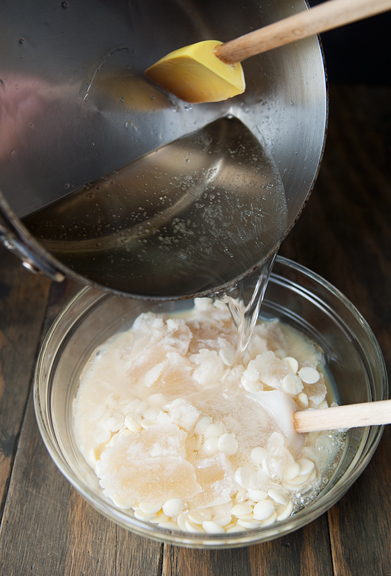 Place the gelatin, sweetened condensed milk, and the white chocolate in a large bowl. 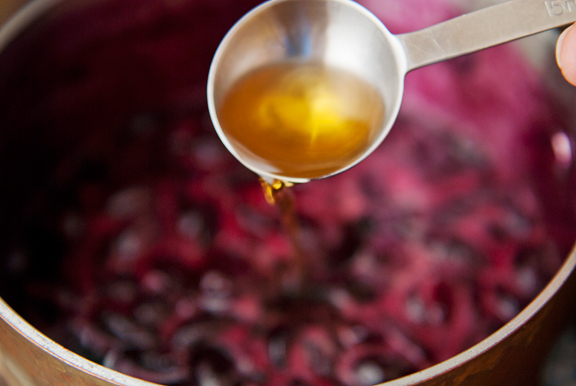 Pour the hot sugar syrup over the contents of the bowl and let the heat melt the gelatin and chocolate. 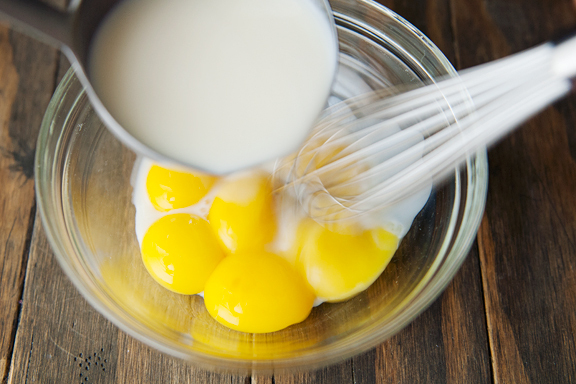 Use a hand blender or stir the mixture until smooth, taking care not to introduce any air bubbles. 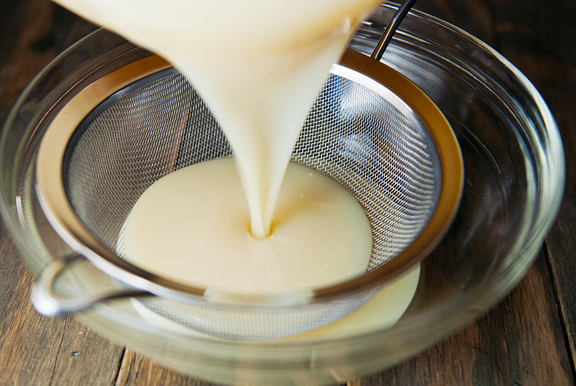 Strain the glaze through a sieve. 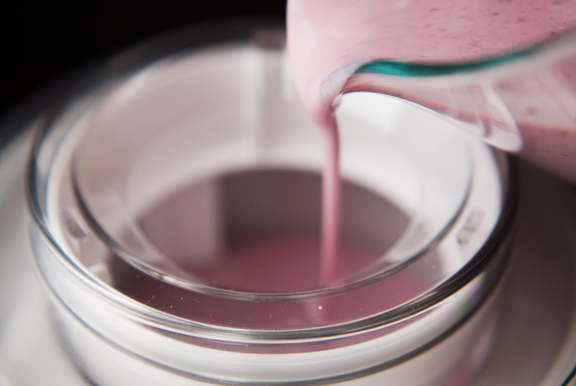 Gently stir in the food coloring. 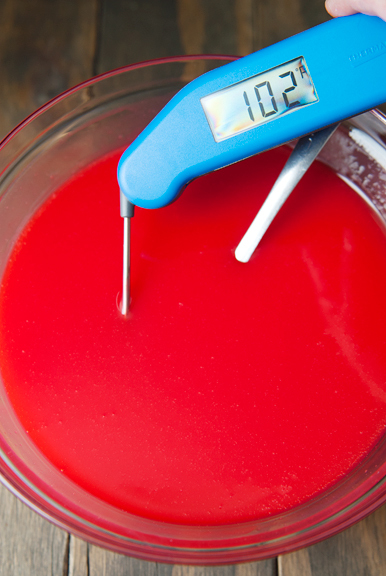 The glaze can be poured over a very cold object once it reaches 95°F. The glaze can be gently re-heated in short bursts in the microwave. Makes about 6 cups of glaze. 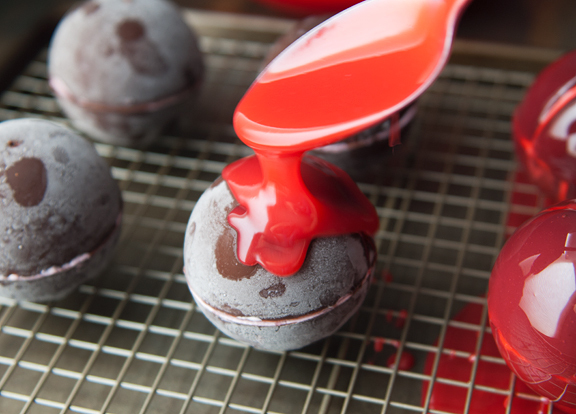 Glaze the bombes: Place a cooling rack on a rimmed baking sheet. Arrange the bombes at least a few inches from each other. 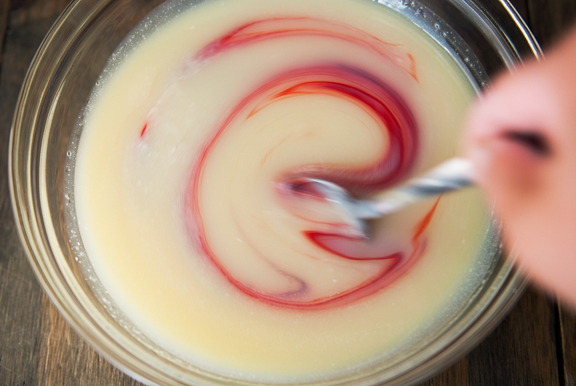 Pour the 95°F glaze over each bombe in a circular motion starting from the center (top of the sphere) and spiraling outward to get an even glaze over the entire sphere. If you feel the bombes need more glaze, apply the glaze another one or two more times (it sets in a few minutes). Return the bombes to the freezer. Serve cold. Makes 6 1-cup bombes. This looks fantastic. 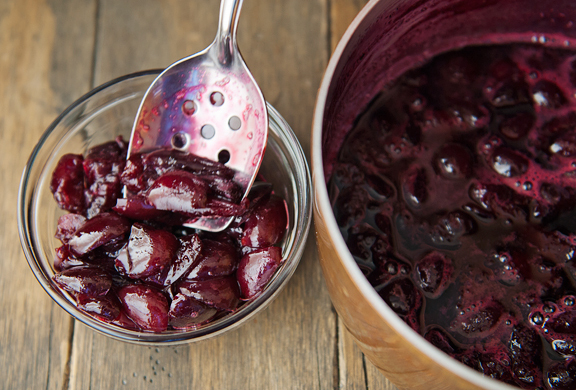 Every recipe that you put on this site is great, but this looks just fabulous. Thanks for your recipes and also your photos. You are an artist at heart. You just do it with food instead of a paint brush! I also marvel at your patients when working with unknowns. Not everyone would live up to these types of challenges but you just forge ahead. If I had a sister I’d like her to be just like you. I’d be at her house eating all the time. Thanks for sharing. I love how Jeremy seems to be waiting behind you to delve into the bombs the moment you are done photographing! You’re amazing! 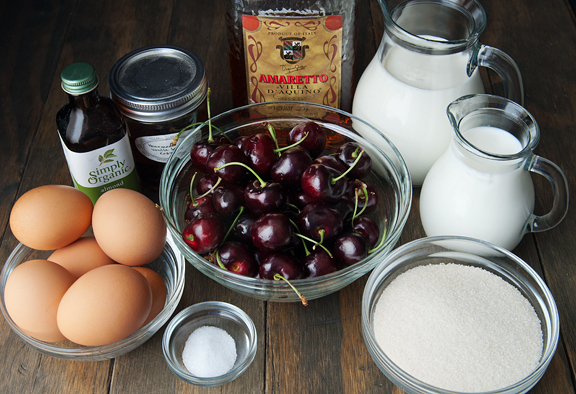 I smiled fondly at your reasoning that “someone gave me some cherries so I had to decide what recipe to try” — my first and only thought would be “I have to eat them.” LOL! I think the only time there is too much ice cream is when I overfill my ice cream maker. Other than that….nope. These look so good, and I admire your patience and skill. 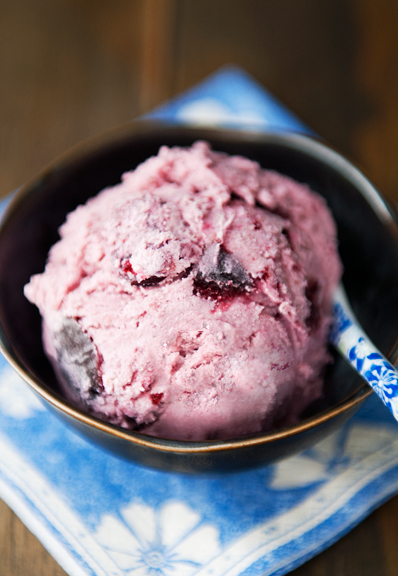 I would’ve gone with dark chocolate chunks in my cherry ice cream, and called it a day! Those were yummy! I have already eaten them with my eyes. Thank you for the pictures and fine recipe! I hope you’re doing well. Your dad looks very happy, indeed. Oh, honey, when I was young many moons ago I tried out some really hard stuff. You are so much better than I ever was at it. 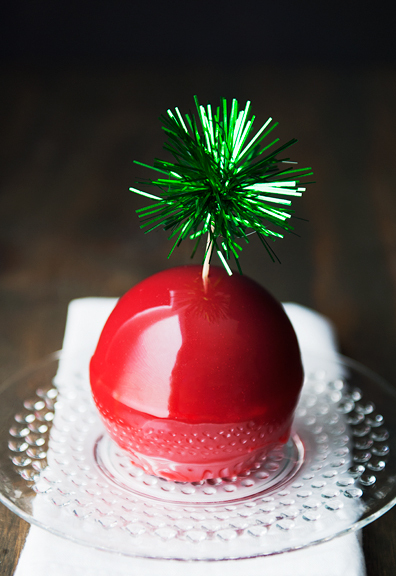 Those cherry bombes are incredible! I didn’t know what I didn’t know so I would get out these elaborate – really hard – recipes and think, “Oh, I can do that!” I had just gotten married and was 18 so go figure I thought I was superwoman. I had many, many, MANY failures with a few winners in there – enough to spur me forward with new, harder recipes. I wish I could say that I was a chef now or something but I don’t feel like a comfortable cook. I doubt I can make most things now. Maybe it’s because it’s not my favorite thing to do. I wanted it to be but it just isn’t. You go girl!! You did an amazing, awesome job and you were courageous to try. :) I’m glad you did. Don’t lose that courage! :) God’s Blessings! Wow, are these impressive and beautiful! Job well done!! These will be put on the back burner for a long time and revisited when I don’t have two young sons, a 9 week old lab a nervous 5 year old lab from having a new family member! I want to make these….eventually! Love all the details about your thought and learning process. What a fun, beautiful project. 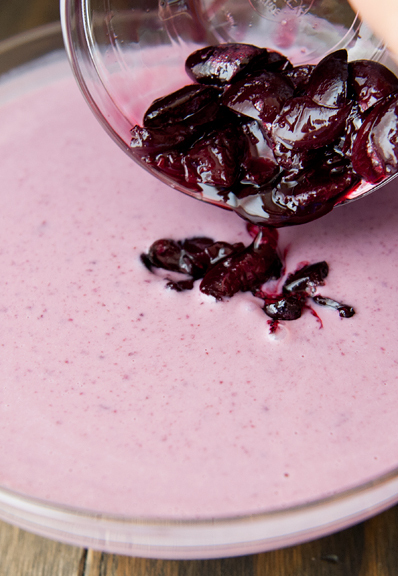 I understand what you mention about using a mousse instead, but oh, that cherry ice cream. Just watched a mirror challenge on the British Baking show last night. Reminds me of the strawberry dessert Peabody hosted in early Daring Bakers days. This is beautiful and so impressive! I don’t care for fruit and chocolate together but even I would love to try this! I am so tempted to make this recipe this summer! 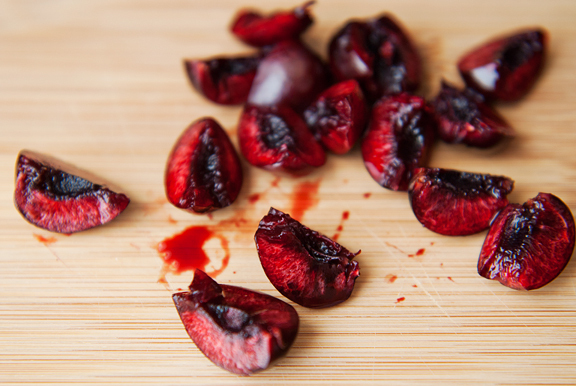 I live in an area full of cherry orchards and always end up getting a ton of cherries from neighbors and friends and I never can eat them all in time… Usually we get those awesome Rainer cherries (really good eating! 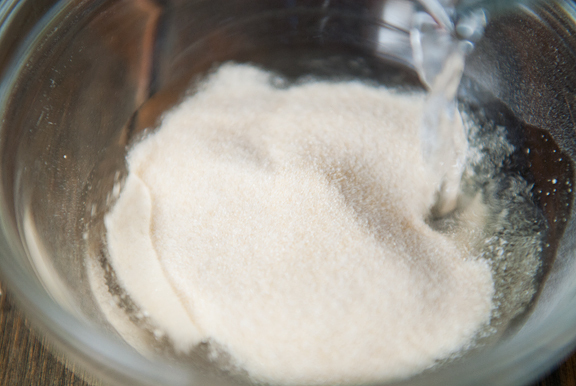 ), but get a bunch of Bings as well… I think I’ll reserve some of those for this recipe this year. 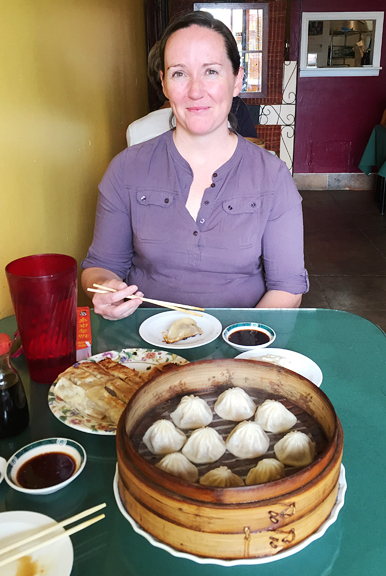 Jen- would you mind revealing the name of the restaurant where you took the photo of Erin with those incredible-looking Soup Dumplings? 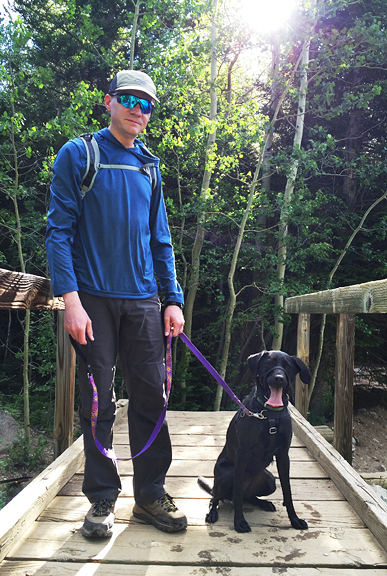 My daughter is coming home to Boulder for her birthday and I know she’d be thrilled to celebrate with those gorgeous delectables! Thank you. Jen- would you mind revealing the name of the restaurant where you took the photo of Erin with those incredible-looking Soup Dumplings? 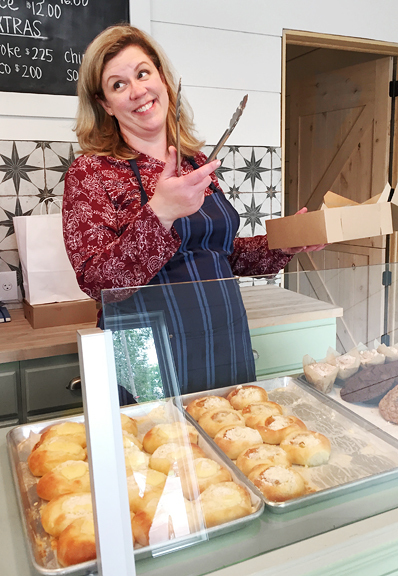 My daughter is coming home to Boulder for her birthday and I know she’d be thrilled to celebrate with those gorgeous delectables! Many Thanks. 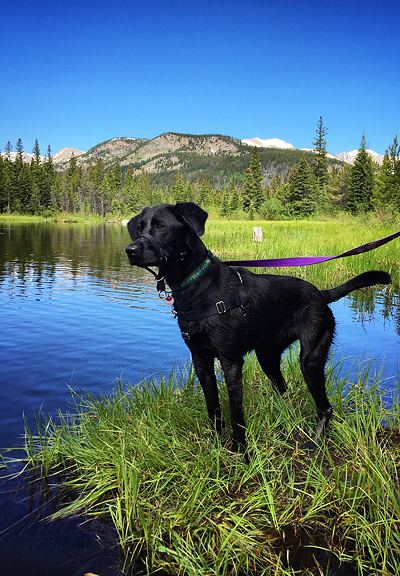 There are many ways you and I are different–I am definitely a city mouse, camping to me means that I’m at a Holiday Inn, and the mammal that inhabits the house with me is 9-year old boy. However, as soon as I read the following sentence, I laughed aloud and realized that in some ways, we are kindred spirits, because the state you describe? I know it all so well. This made me laugh and made me happy. WOW!!!! I’d love to be your clean up gal….everything looks delicious. And your finished product…perfect for a pre-4th of July! 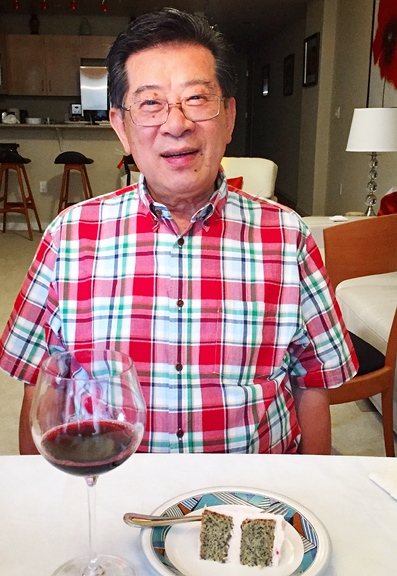 Happy Father’s Day, Senior Yu! You have an amazing daughter. Jen, I have no idea what was dumb about anything in that post. Time consuming, maybe, but I’m sure you felt great satisfaction when you took those last pictures. If those bombes tasted half as good as they look, they were surely incredible. Congratulations! Bette – I did eat a few! 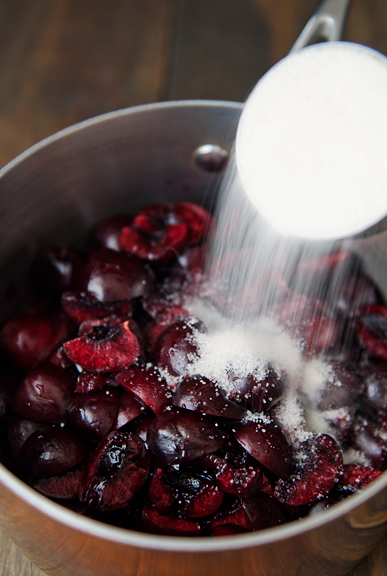 And then I decided to make some recipes, but yeah, I LOVE fresh cherries! Laurie - Glad I emailed you right away because clearly I am VERY late getting to these comments. For anyone else wondering, it was Lao Wang Noodle House in Denver. Read the reviews so you know what to expect (don't be rude). Jill Hyde - Thank you, dear! Rose - Thank you. Dumb - as in - I was dumb to try and commit to such an involved project. Oy!